Kodaikanal -"Princess of Hill stations" is a hill station Situated on the southern ridge of upper Palani Hills in the Western Ghats . Kodaikanal is around 120 km from Madurai. It is sitting on an altitude of 6,854 feet above sea level and is among the most visited tourist destinations of South. It also has the distinction of being the only hill station in India to be established by Americans.The hill station is full of natural marvels like Fairy Falls, Coaker's walk, Green Valley view, Pillar Rocks and Dolphin's Nose. For peace lovers, it offers serene and calm atmosphere that is intoxicating and refreshing whereas for adventure lovers, it proves to be a heaven with ample of trekking opportunities available through out the town. 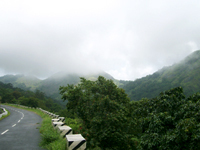 The town is surrounded by thick dark forests and it seems as if the this gem of a hill station is actually being enviously guarded by this dark forest. 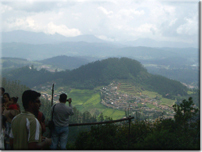 In fact the name Kodaikanal itself means 'The Gift Of forest'. The nearest airport is Madurai about 120kms and coimbatoor180Kms. 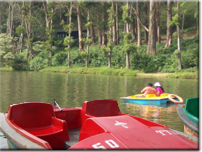 The star-shaped lake located in the central point of the Kodaikanal is one of the major tourist attractions of town. The entire lake spread over an area of about 60 acres. The lake is surrounded by a variety of trees like Pine and Eucalyptus. Apart from enjoying the relaxing view of the lake, you have an option for boating courtesy the Boat Club or you can savor a small horse ride along the sidelines. Solar Observatory is just 3 km away from the Kodaikanal Lake. It is one of the three solar observatories in the world that were built more than 75 years ago. It is situated at an elevation of 2343 meters which is the highest point of the town. You have to book a ticket for the scheduled shows to get an experience of the solar system, which surely will be worth the money and time you spend on it. Kodaikanal is famous among travelers for the most scintillating viewpoints from where you get the most panoramic glances of the entire Kodaikanal hill station. The best viewpoints here are Green Valley view point, Pillar Rocks, and the Dolphin's Nose. A visit to these viewpoints and a glimpse of the nature's marvel from them can be the best memory that you take from here. Kurinji Temple- During the winter,the apparent view of kodai city and Palani from the two ends of the temple is blocked.However,in summer,the visibility is good and hence the experience too. Situated just 5 km away from the town center, Fairy Falls have become a famous destination for picnics among localities. Another fall named Glen falls is just around the corner and is equally famous. These falls are nothing short of a destination blessed by nature itself. Pillar Rocks - huge steep cliffs which look like "Pillayar" (Lord Ganesh in local language Tamil).Watch out for the cross at the top of the mountain hoisted by an English adventure enthusiast.